Dalmatian Temperament (Energetic, Outgoing): A Great First Dog To Own? 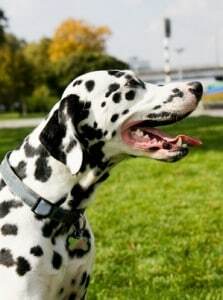 The Dalmatian Temperament (Energetic, Outgoing): Is It A Great Dog for the Novice Dog Owner? If you have never owned a dog before, then the Dalmatian temperament is likely to suit you very well. That is IF you can also match the Dalmatian's desire to be active. The Dalmatian's temperament to say the least is both Energetic and Enthusiastic. This distinctive-looking working dog used to run alongside the horses and carriages of the 19th century to deter attacks from robbers and highwaymen. He has outstanding endurance and a need for lots of exercises. No wonder he used to spend so much time on a fire truck! His love of people means he makes friends with everyone, but be careful – he is quite exuberant and may well knock you over. Keep an eye on your dog around small children, as they may inadvertently get hurt. An appealing part of the Dalmatian temperament is his ability to smile. He will wag his tail while baring his teeth, and it can look quite frightening until you get used to it. This dog needs an active owner. He rarely becomes tired and always seems to have plenty of energy. The Dalmatian is a great breed for a runner or jogger, as he can accompany them on all their training runs. Insufficient exercise will have an adverse effect on your Dalmatian's temperament. He will become rowdy and frequently jump up on you. His boredom will lead to destructive behavior, like digging and chewing. Just make sure you take it easy until he’s about two years old. Until then, his bones and joints are still forming, and if you overdo it on the exercise, you can actually injure him. One thing that people enjoy most about the Dalmatian is his affectionate temperament. He just loves to spend time amongst his family members and will cheerfully cuddle up on the couch with you. If you keep your Dalmatian in the back yard and don't give him the opportunity to share your life, he will bark, dig or chew to express his unhappiness. And really, could you blame him? But one of the disadvantages of owning a clingy dog is the increased risk of separation anxiety. To prevent this, train your Dalmatian from a young age, and teach him to settle in a crate while you are out of sight. Give him toys and Nylabones to gnaw on, as these can keep him occupied while you are away. Anxious dog temperaments can be difficult to manage, and an animal with this tendency is a lot of work for his owner. An intelligent Dalmatian dog temperament needs regular mental stimulation. Your four-legged family member is very clever, and he is quick to learn. With regular obedience training, he will become a well-behaved and easy-to-live-with member of your family. He will thrive on agility and fly ball training. This will give him the opportunity to learn new tricks. As a result, he will then be less likely to come up with his undesirable behaviors which can take the form of destructive entertainment. Training will also help you to control his boisterous nature and prevent him bowling people over with affection. You will need to be fair and consistent when training your Dalmatian. He is an independent thinker and can be difficult to train. Positive training methods work best with this dog's temperament. He will respond particularly well to clicker training and food rewards. The sensitive Dalmatian temperament means he may withdraw from you or even lose trust in you if you resort to harsher training methods. If you have seen the movie “101 Dalmatians”, you have seen the animated version of how gorgeous these spotted puppies can be. Unfortunately, unscrupulous people decided to take advantage of the sudden increase in the Dalmatian's popularity and bred dogs purely as an income source. They didn't evaluate any dog's temperament before mating them, and they allowed poorly behaved dogs to reproduce. The result became widespread Dalmatian temperament problems. This generation of Dalmatian dogs was hyperactive, aggressive, and extremely stubborn. Before you choose your new puppy, do your homework and don't just look at the physical aspects of the parents. Make sure they have a sound temperament too, and the dog you eventually choose should be a delight to own. 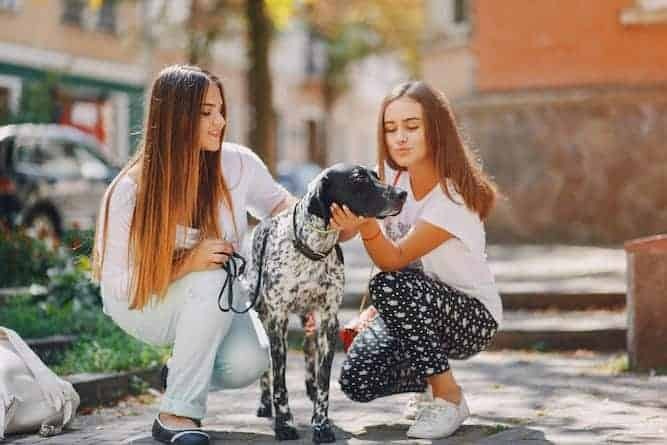 The Dalmatian is an ideal breed of dog for most people, provided you can exercise him enough and that you are prepared to put the necessary time into training him. If you can do these things, then the cheery and outgoing Dalmatian temperament will bring your family much joy. 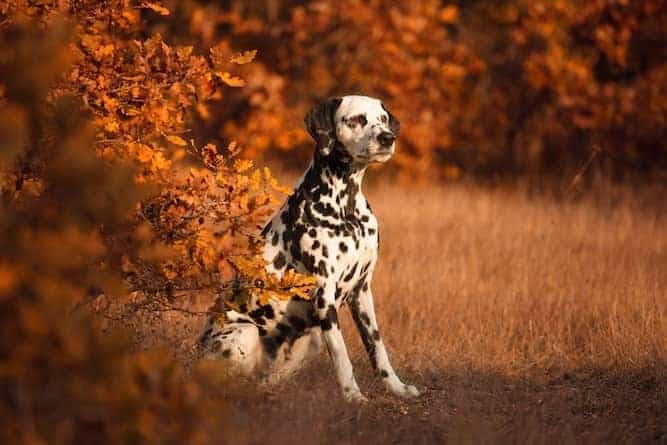 Some of the most important Dalmatian personality traits to know are how he behaves with other animals, and whether his temperament changes in certain situations. For instance, some dogs are great with other animals but terrible with dogs of the same gender. Other dogs can’t be around smaller animals who they could consider “prey” because they will constantly hunt them or give chase. In the Dalmatian’s case, let’s start with cats. The Dalmatian’s temperament with cats is great, provided you introduce them early and/or socialize them often. For instance, Dalmatians who grow up with cats typically have no problems with them. Dalmatians who meet cats later in life have to get to know them to develop a relationship with them, just like anyone else. Dalmatians are typically good with other animals and, for some reason, are especially great with horses! And there’s no real difference in temperaments between a male and a female Dalmatian. Just like any other dog, males lose their tendency to dominate when you neuter them. With neutering comes complacency. Experts have found the earliest illustrations of the Dalmatian in Croatia, tracing back to around 1600. 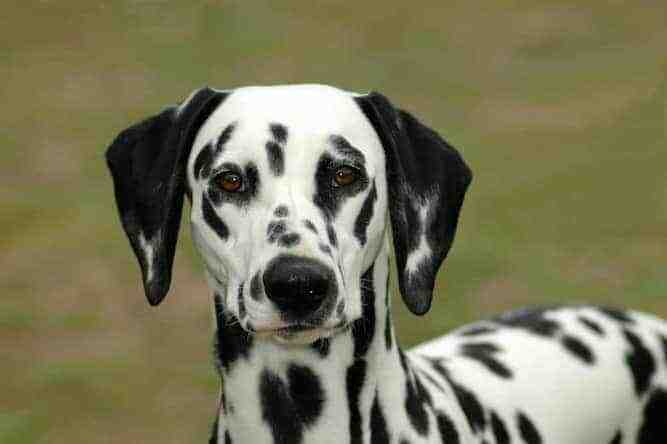 In 1771, writer Thomas Pennant wrote that the origin of the Dalmatian is Dalmatia – hence the name. The Dalmatian became a status symbol during the U.K.’s Regency Period. People especially loved those with more decorative spots. Dalmatians would jog alongside the horse-drawn carriages of the elite. Breeders showed the first Dalmatian in 1862, and in 1890, the first Dalmatian club formed. Because he’s a shorthair, you don’t have to do much to maintain the Dalmatian’s gorgeous coat. Give him the occasional bath and weekly brushings to remove any dead hair that he sheds and to keep him looking his best. Also, as with other floppy-eared dogs, you must regularly check and clean his ears to prevent infection. If you’re not quite sure how a professional groomer can show you what to do. Urinary stones are especially important to be aware of in Dalmatians because their unique metabolism can cause the development of stones in the urinary tract. Make sure your Dalmatian is urinating regularly, and make sure he always has plenty of fresh water available to him. The Dalmatian’s life expectancy is between 10 and 13 years. Their average weight is between 35 and 53 lbs. for a female and between 33 and 71 lbs. for a male. Their average height is between 22 and 24 inches. So, you've decided that you'd like to become the owner of a new Dalmatian puppy. That’s great! You can find a Dalmatian for sale either through a breeder or at your local rescue or adoption center. The price of a Dalmatian dog changes based on whether you go through a breeder or a shelter. So, if the price is an issue for you, you may want to consider adopting instead. The average Dalmatian price is around $800, though you should probably budget for closer to $1,500. However, the price of this dog can vary wildly, depending on where you get him from and whether he is of show quality. Some Dalmatian puppies can cost as much as $5,000! If you want to adopt a Dalmatian puppy, you may be able to find one at your local animal shelter. Adoption is your best bet if you’re either on a budget or don’t want to bother with training a small puppy. If you don’t want a puppy to nosh on your new couch, or pee on the floor in the middle of the night, then an older dog may be a better choice for you. 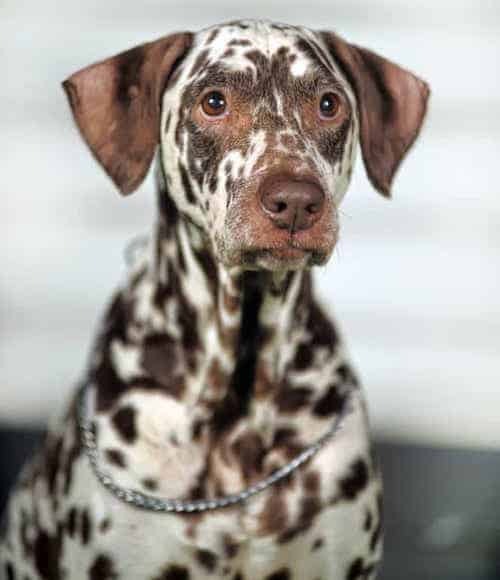 Dalmatian mixes are very common, especially in shelters. If you think you would prefer a mixed breed dog, then the shelter is a great place to check. Dalmatian breeders are pretty common. Because of this, it’s perhaps even more important that you do your research before choosing the breeder you’re going to ultimately buy from. Choose an AKC-referred breeder or a breeder who comes recommended from an official site for the breed. Chances are these breeders are trustworthy because reputable organizations would be less likely to back them if they weren’t. 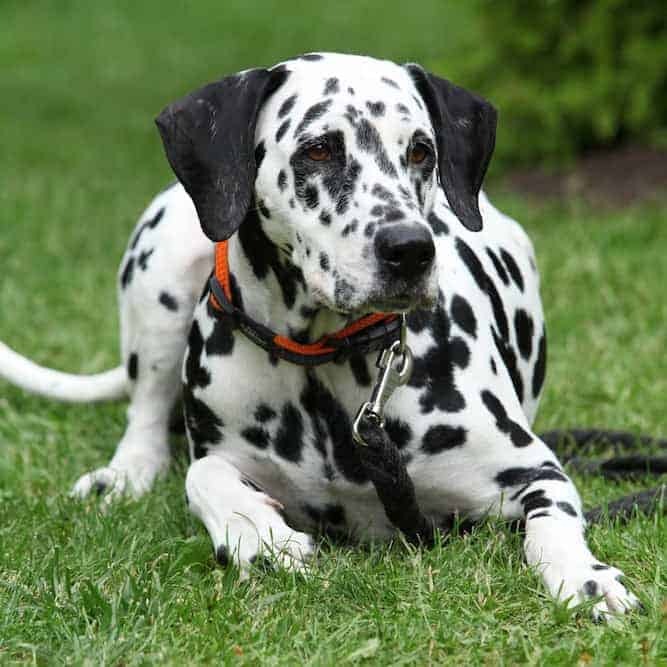 The Dalmatian belongs to a group of dogs known as the “Non-Sporting Group.” What this means is that breeds in this group are all over the spectrum when it comes to appearance, and their temperaments are just as diverse. 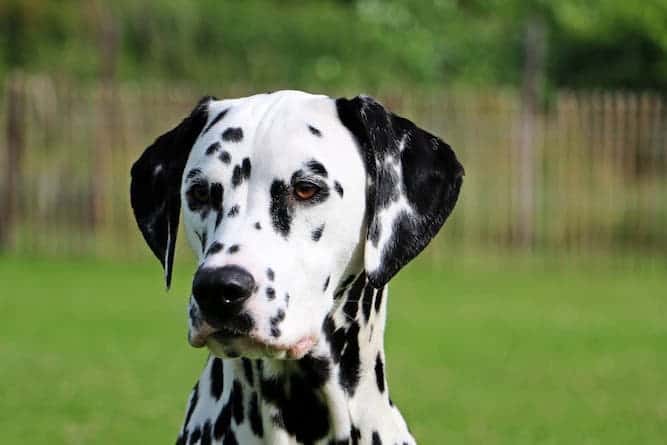 If you think the Dalmatian may not be the right kind of dog for you, check out the temperaments of some of the other members of this group to get a feel for their personalities. The energetic Dalmatian dog temperament makes him an optimal choice for the jogger or cyclist who would love to have a doggy companion. The Dalmatian loves to exercise both his mind and his body. The playful Dalmatian dog temperament also makes him an ideal family dog, as he is great with children. Just be careful with him around smaller kids, as he may accidentally knock them down and injure them with his larger body. There aren’t too many health concerns to worry about with this guy. Just keep an eye out for urinary stones. 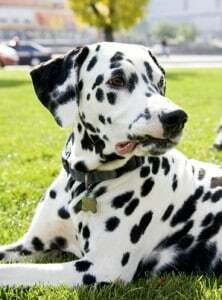 These are common among Dalmatians because of their unique metabolism, which processes uric acid differently than do the bodies of other dogs.